That has certainly been true this year, as the Valley View Tigers are undefeated (31-0) and on the way to the state tournament. The Tigers will face Frisco Wakeland at 7:30 p.m. Thursday at Birkelbach Field in Georgetown in the UIL Class 5A state semifinals. But that phrase has also been true ever since the two were little. They started playing together when they were 4 years old. The two grew up in Reynosa, Mexico. Chavez remembers De Los Santos’ father was the coach on one of their teams. That time period is when they developed their saying. By now, most people know De Los Santos for his performance on the pitch this year. The junior forward has scored 69 goals, putting him three shy of the school record set by Jose “Torito” Soto, who played for the Tigers from 2011-14. Chavez has made his mark for the Tigers this year, too. 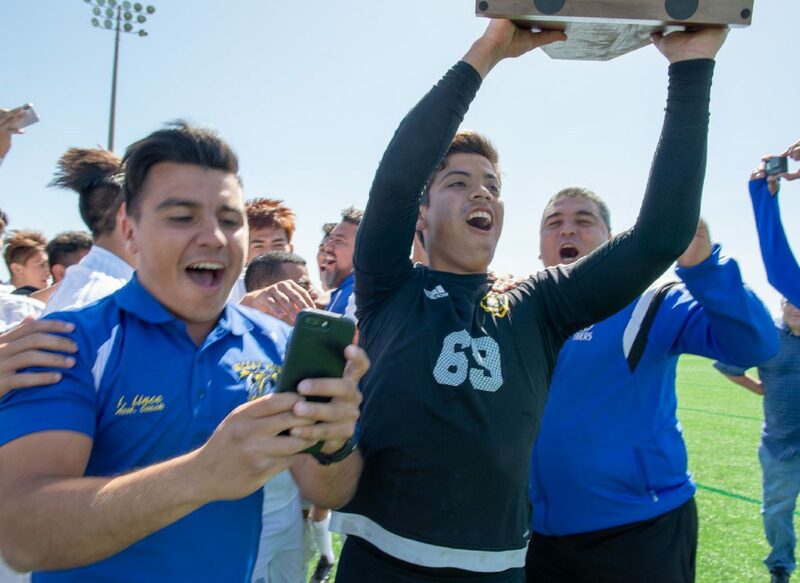 In the Class 5A regional quarterfinals, Brownsville Lopez came back after Valley View built a 2-0 lead to force the game into penalty kicks. Chavez stopped two of the three penalties he faced to help the Tigers advance to the regional tournament. Chavez and De Los Santos played together for many years in Reynosa before Chavez left for the United States. The two were separated for five years. They were reunited when De Los Santos came to Valley View. Back on the pitch together again, they brought back their catchphrase, and they picked up right where they left off in their friendship. Chavez can make every save he is asked to, whether it is high or low, left or right. He also excels with the ball at his feet. His ability to play the ball after a save allows the team to push up quickly. 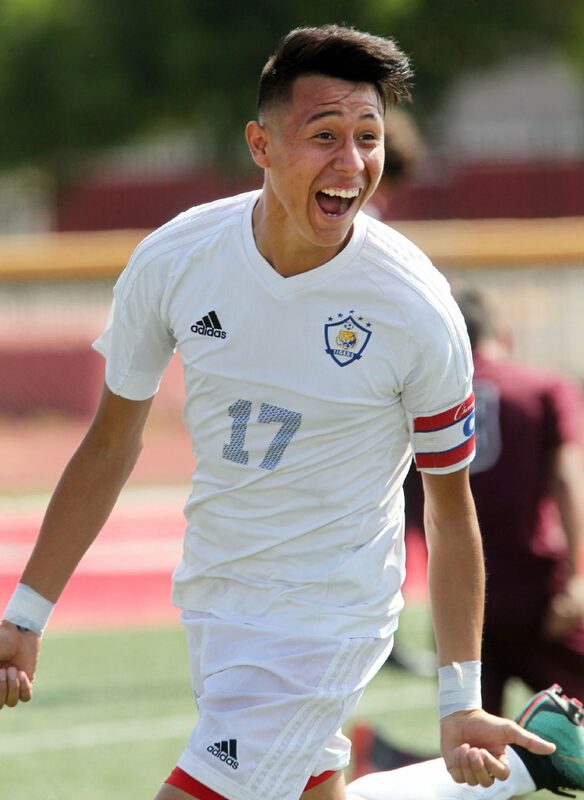 “Elian has the talent to play out in the field, but he’s such a good goalie that it demands that he play back there,” Valley View coach Damian Magallan said. “He could play as a winger for this team, but we have two very talented players on the wings that play that role already. Magallan assumes Chavez could play in the field. De Los Santos has already seen it. Magallan spoke highly of the middle of his formation, calling it the “backbone of the team.” That group begins and ends with the duo from Reynosa, but other skilled players factor in the middle, as well. Chavez and De Los Santos were dominant even when they were younger, playing together in Mexico. Sophomore teammates Carlos Medina and Rogelio Saldivar grew up in a different part of Reynosa. They never really knew De Los Santos, but they always knew of him, because his talents were so well renowned. De Los Santos’ ability has only become more recognizable since he arrived at Valley View. Another factor is driving De Los Santos nowadays. Each of his 69 goals this year had added meaning. De Los Santos dedicates every goal to his late grandmother, Paola Castillo. Castillo died in 2005. He carries her in his heart every time he steps onto the pitch. After each game, he thanks her for his health and for his goals. He hopes to be thanking her a lot on Thursday. De Los Santos is coming off back-to-back games with a hat trick. The whole team appears very amped up for the opportunity. Valley View has not been to state since before any of the current players made the varsity roster. The Tigers last appearance at the state tournament was in 2014. “I feel like we had to get some experience as a team in order to get back to the state tournament,” Magallan said. “We were so young, but now, we have that experience. We have been there before, so we know how to prepare for it. We know how hard we have to work. This team, right now, is ready to bring home the state title. No matter what happens this weekend, the Tigers’ outlook is bright. Especially because they will have De Los Santos returning for his senior year. That time will come soon enough. For right now, the focus of the team is undeniable.